From Marc Robinson,– Well, after 8 years of drought it seems this could be the year the entire state finally comes out of that. We have had more rain over the past 3 weeks then we did all of 2018 here in Ventura county. The field flowers of Larkspur and Stock will continue to be limited. The rain will definitely slow the production of all crops. It is uncertain to what degree it will affect Valentine’s Day. 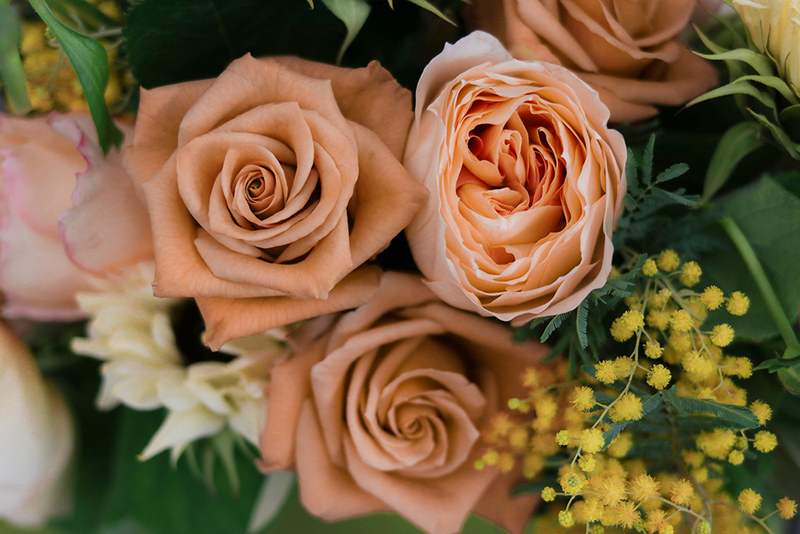 We are closely monitoring all flowers and growing regions to determine where we are going into Valentine’s Day. Lisianthus, Matsumotos and Snapdragons are slowing in availability. Sunflowers are in short supply this week but will be available and of good quality starting next week. Butterfly Ranunculus are increasing in production. Waxflower is going to need some special attention by the farms after all these rains to be sure there are no quality issues going forward. Lilies are in good supply in all colors. Gerbera are still in low production. Delphinium Belladonna is in steady supply. Kale is in season with full color including some Lace and Rosette varieties. Heather is available from Northern CA now but slowed on and off due to rain. Bells of Ireland are slowing down because of cooler weather. Ginesta is also back in solid white or also tinted colors! Tulips, French Tulips and Iris are in good supply with good availability of solid colors in Tulips. Solidago, Amaranths, Dianthus, Gomphrena, Matrecaria and Statice are all available. Chocolate Lace and Queen Anne’s Lace are very limited. Scabiosa are slowing in production. Bupleurum is available but in limited supply. Greens are in good supply: Seeded, Silver Dollar and Baby Euc. Gunni Euc is still limited. Narcissus are in early this year from north central CA. Do not forget we have the ability to source garland for you, but order early! As always please let us know if we can help with your special needs. Agonis – This weekend we will get our last shipment of Agonis for the season. It should start up again sometime in the summer. Emerald – Expired permits and the government shutdown has left the market almost completely dry. Emerald in all sizes, including Jade, is practically non-existent. Standing Orders will be an issue and we will have very little available for open market. We should see this get better in the next couple of weeks. Eucalyptus – Seeded Euc is a problem going into next week. The season was already dwindling and the rain isn’t helping this. Expect extremely limited availability from here on out. Queen Anne’s Lace – White Laceflower will continue to be VERY Limited due to lower levels of production. But we will good availability of Green Mist. Statice – Lavender, Pink and White Statice will be limited through Valentine’s Day. Limonium – Limonium is not a plant that can be cropped for Holidays. Both White Limonium and Maine Blue Limonium will be extremely limited. With regards to Valentines availability, we will have VERY limited numbers of White Limo available and high priced. Alstroemeria, Carnations, Mini Carnations – We have a good supply for now, but prices are climbing quickly to Holiday pricing. Lilies – 2 Bloom Oriental production is VERY limited, especially as we move into Valentine’s Day. California Lily pricing will be moving upwards. Growers are seeing increased costs of production, including what is now the highest minimum wage law in the US. It is almost a guarantee those costs will be passed on in the form of higher selling prices. For Valentine’s Day production, California production seems to be coming on time, with potential of a slight delay. Costa Rican production is on time. Ecuadorian production is on time for LA’s and early for Orientals. Mums, Pom Pons – The newer Disbud varieties seen over the past 4 months are being grown in limited numbers. Production is somewhat spotty as growers get used to the characteristic of each individual variety. Please be VERY careful with sales of Red Disbuds for wedding work over the next three months. Production is VERY limited and not available on a regular basis. Aster– We will be carrying Tinted Aster again for Valentine’s Day. These were really popular last year and sold out fast. We have two different boxes. 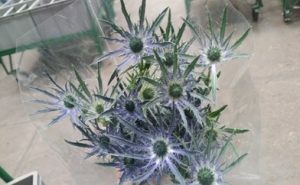 Blue Pagoda Flower – Below is a photo of a new flower that one of our growers from Ecuador is growing, Item # 35476- Give them a try and let us know what you think. Calla Lilies – There is a great supply of White Mini Callas for next week and at good prices. Crystal white, White Perla, Crystal Blush, Aspen and Ventura are all loaded and ready. The weather has affected production of large White Callas and a number of our growers reduced our original orders. We may run out of particular batches early. We expect this to be the case for the next few weeks. Stock – January has arrived. Unusually cold weather in the Desert growing region has stalled production, and the Baja has not kicked into gear. The forecast for next week is even worse, which means this will continue into week 4 of 2019. We have supplemented our inventory with Ecuadorian Stock where possible. Prices have increased and we expect we will run short very early next week, especially White, Lavender, and Purple. Larkspur – Normally at this time of year we have very little larkspur to offer, and the cold and rainy weather has made it worse this year. The California producers are finished and we are waiting for the Baja to begin. We have been supplementing our inventory with Ecuadorian Larkspur which has been nice. However, production from Ecuador is also very limited. We expect to run out early next week. Limited availability will be the norm through January. Bells of Ireland –Supply is great, quality is great. Waxflower – Seems to be good availability and the quality is great. Delphinium – There is a good supply for next week. Hybrid Delph from California is starting, and there seems to be a good supply from Ecuador. We try to manage Delph carefully this time of year to avoid long rotation in the cooler. Heather – Pink heather from California is still available. This may be wrapping up soon. Iris – There seems to be plenty of dark blue but colors are limited. There is very little demand this time of year. Snapdragons – Short days, long nights, and cold weather is a recipe for limited production from California and Canada. As you look at the inventory today it looks great, but with little in the market, we expect to sell through quickly especially the colors. Prices are up. Asters Matsumotos & Dianthus Amazon – The cold weather has stalled the production of Matsumotos. Our inventory will be a little better for next week but we could see shortages. Dianthus Amazon, Solomio and Green Trick are all available for next week, demand has really slowed so we will limit our purchases. Lisianthus – Production is California is still very Limited, but we will have a good availability from Israel and Holland. Scabiosa – Demand for Scabiosa has really fallen of and we will reduce our purchases to keep our supply fresh. Thistle– Due to the weather we won’t have any Dynamite Thistle coming in for next week. The farm expects production to be very low the next few weeks. We do have a new variety coming in called Alpinum. This is a 10 stem 60cm bunch. Let us know if you like the new variety. We will also have a few cases of Blue Bell. Protea, Leucadendron and South African Product – There is a good supply of Pink Protea for next week. King protea from South Africa is ending and we are moving to Hawaii and California. Artic White King Protea is finished for the season. We do not expect to have White Kings for some time. Every year at this time the farms in South Africa close for a month. It is the dead of summer and they use this time to give their workers time off, clean the farms, and begin to replant. What does this mean? Brunia, Berzelia, Coned Leucadendron, and some Protea will be limited and may not be available. All of these items will be a challenge until the end of January. Sunflowers – You will see added items from Peru and California for next week. Production is starting to ramp back up.